We look forward to sharing Cartograph wines with you! 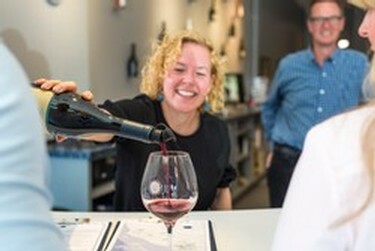 In the tasting room we spotlight masterfully crafted cool-climate Pinot noir and Alsace styled whites, by the glass, by the bottle or on tap - a first for Healdsburg. We are located in downtown Healdsburg which is a wonderful town to walk around, taste wines, and enjoy delicious meals. We will happily share suggestions about where to taste wines, great dishes at local restaurants and help you plan your visit. Taste through five of our current release Cartograph wines. Our daily flight focuses on wines from both the Russian River Valley and Mendocino Ridge. The tasting fee is $20 per tasting and each fee is waived by joining the Cartograph Circle or with the purchase of two bottles of wine. Reservations are required for groups larger than 6. Please contact us at 707.433.8270 to set up an appointment.